The big cat just got bigger: simply enter the values you want, then click Save. Easy! Apps such as iPhoto make improving your photos a breeze, enabling you to change the colour balance, lighting levels or even crop your shots for a better composition – but what if you want to turn a favourite 8x10 shot of your cat into A1 poster size? Under normal circumstances you'd expect to get a shot full of picture noise, JPEG compression artefacts and other nasties. But it doesn't have to be that way. PhotoZoom Pro 4 uses a image-resizing algorithm called S-Spline that enables you to resize shots by up to a million pixels, without any real loss in picture quality. It works a bit like the bicubic resizer in Photoshop Elements, only it's much, much better. 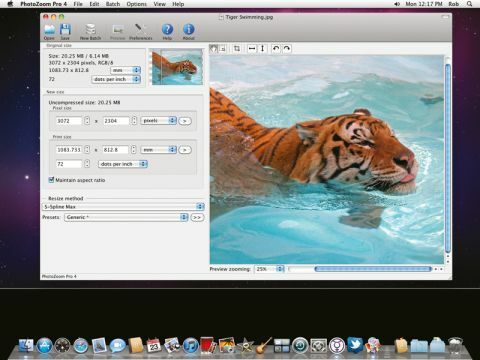 Resizing your pics in PhotoZoom Pro 4 couldn't be simpler. You open an image, choose how much you want to resize it by and then choose screen or print resolution. The app uses S-Spline Max by default, but there are other presets to choose from. You can even tweak the results using options available within each preset, so you can make images look softer or sharper, for example. There's also a batch-processing mode so you can resize folders of images and the app works with iPhoto libraries too. Of all the presets available, S-Spline Max works the best, producing good-looking resized images. Excessive resizing can, however, make some images look artificial, which proves that while PhotoZoom Pro 4 may be good, even it can't perform miracles.